The Launch party for Waking Lucy was a huge success if running out of books is any way to measure. The wonderful ladies and My Girlfriend’s Quilt Shoppe gave me a nice spot near the door. So many friends came including one who drove over three hours. I may have screamed when I saw her. 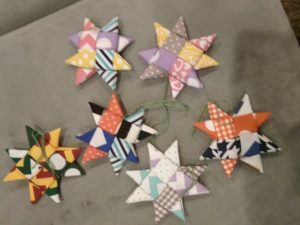 Everyone who came received a quilted star ornament. The thread color determined the door prize. There were lots of cider (packets – a fabric shop is not a good place to eat) and Kisses (Hersey’s made) for everyone who came. After all what a better way to see if Lucy was right and King Solomon was wrong? Later that evening I was invited to join the local authors in a signing at The Book Table for their Midnight Madness sale. I officially ran out of books. However, patrons were invited to pre-purchase a signed copy at the sales price by taking a bookmark with the sales sticker on it to the checkout. I still find buying a $14 bookmark (before sale discounts) very funny. The next morning we invited the local Fire Department to our house. As my friend pointed out, “At least you didn’t have to worry about your books.” Fortunately for us, the problem was all smoke and no fire and life continues on. I have mostly finished the sequel … So I am starting on the third book and a novella.